COMPTON, Calif. /California Newswire/ — Today, Calif. Assemblymember Isadore Hall, III (D- Los Angeles), Progress California, Major League Baseball’s Urban Youth Academy, the Los Angeles Dodgers, Martin Luther King, Jr. Community Hospital, Advanced America, Anheuser-Busch, The Apollo Group, AT&T, ER, G-Tech, Lumar Industries, Radio Free KJLH 102.3, local elected officials and Omega Psi Phi Fraternity, Inc. announced they are providing over 5,000 turkeys to families in need as part of the 64th Assembly District’s “10th Annual Healthy Family Update and Turkey Giveaway.” This free community event will take place on Monday, November 24, 2014 beginning at 9:00 AM at Major League Baseball’s Urban Youth Academy, 901 E. Artesia Blvd. in Compton, Calif.
Now in its tenth year, the “Healthy Family Update and Turkey Giveaway” is a multi-prong philanthropic collaboration between Hall, local officials and community leaders committed to reducing incidents of obesity, diabetes and HIV/AIDS in underserved communities while promoting healthier lifestyles for children and families. KJLH Radio will do a live remote broadcast with Assemblymember Hall during the event. In addition, free diabetes, HIV testing, blood pressure and BMI health screenings will be available to residents. Guest speakers will provide information about hypertension, obesity, diabetes and kidney care, as well as healthy eating tips to make it through the holidays. Representatives from Covered California will also be on hand to provide information and help residents sign up for free or low-cost health insurance under the federal Affordable Care Act (ACA). Hall’s 64th Assembly District has the second highest concentration of residents eligible for financial assistance through the ACA in California. This event will help over 10,000 residents in Los Angeles County enroll in Covered California’s highly successful health insurance marketplace. Free turkeys will be distributed on a first come, first served basis. 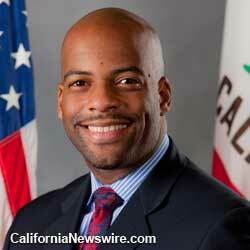 Members of Omega Psi Phi Fraternity, Inc.
Assemblymember Isadore Hall, III, represents California’s 64th Assembly District that includes the communities of Carson, Compton, Gardena, Harbor Gateway, Lynwood, North Long Beach, Rancho Dominguez, South Los Angeles, Torrance, Watts/Willowbrook and Wilmington in Los Angeles County.